New York-born and Florida-raised, Alicia McCracken Morgan taught herself to play the piano at age nine, beginning a lifelong addiction to which there seems to be no cure. Following in the footsteps of her father, a painter and art professor, at fifteen Alicia was working at Busch Gardens in Tampa as a portrait artist, and then a cartoonist – one of the first females hired there to draw caricatures, as the prevailing wisdom was that “women weren’t funny enough to be cartoonists.” But music soon became her primary focus, and she began her working music career while in high school (where she was selected for the prestigious Florida All-State Sight-Reading Choir both times she auditioned, and was ranked in the top ten alto sight-readers in the state for those years) and has been a professional singer, keyboard player and songwriter ever since. Alicia is one of the few people who have actually ‘run away with the circus’, and regards herself fortunate to have had the chance to experience working in an American classic, the tented circus show, which is all but vanished today. After playing in the backup band for a nightclub magic revue, she ended up joining the show as a performer, working for a man who caught bullets in his teeth and doing illusions. She spent the next few years playing carnivals and circuses, returning to winter quarters in Gibsonton and Sarasota in between show seasons. In the King Brothers Circus , she learned (as all women do in the circus) to perform on the ‘web’, the long white ropes that hang from the ceiling of the tent. Alicia also worked in the side show, where she was a fire-eater, Serpentina the Snake Woman and the India-Rubber Girl. Returning to music, she moved to the West Coast, where she worked as a session singer and has a wide musical range that includes blues, soul, funk, rock, jazz, and country. Noted for her raspy blues style, Alicia’s credits include recording and/or performing with such artists as Al Wilson, Delaney Bramlett, Bobby Womack, Sally Kellerman, Kevin Murphy (of Rufus), Don & Dewey, Klymaxx, Billy Vera & The Beaters, The Nelsons, Táta Vega, King Ernest, Peter Tork, Micky Dolenz and Chuck Negron. Her TV experience includes Roseanne, The Jeff Foxworthy Show, The Naked Truth, Almost Perfect, Phenom, and Sibs. She has had original songs in the feature films “Beyond Desire” and Tom Arnold’s “Barhopping”, and was the singing voice for Caroline Rhea in the Disney movie “Mom’s Got a Date With A Vampire”. Her keyboard work has been sampled for several L.A. Riot sample CDs. Alicia’s article about her experience singing on the Neil Young album Living With War garnered her world-wide (if incredibly short-lived) attention. She was interviewed and/or quoted by the LA Times, Editors & Publishers, the London Independent, Rolling Stone and Radio France Internationale. Recent gigs include singing for Neil Young and Oasis, and playing keyboards for smooth-jazz artist Norman Brown. Alicia has been in the studio with legendary producer Richard Perry, playing keyboards on the Rod Stewart album “Fly Me to the Moon…The Great American Songbook Volume V“. Of late, she has been indulging her love for big band jazz, playing with the Jimmy McConnell Jazz Orchestra, along with her tenor player son Sam Morgan. Her blues band The Scorch Sisters, with Francesca Capasso and Kimberly Allison, is finishing up their first CD. Alicia produces and records in her own studio and has received an Addy advertising award for vocals and engineering. 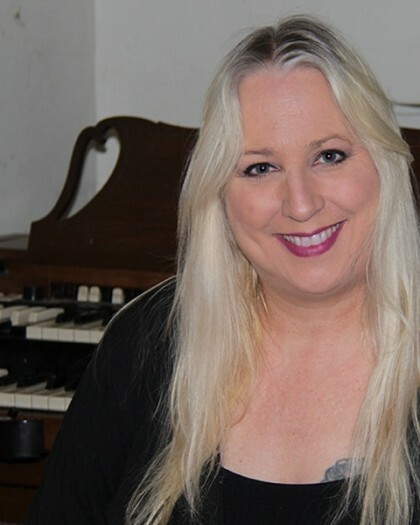 A long-time Hammond organ aficionado, she is the proud possessor of a beautiful 1964 Hammond A-102 and a 1961 251 Leslie. She taught voice, keyboards and computer recording at the Musicians Institute in Hollywood from 2005-2010, and after teaching privately for a few years, is excited to launch Voice Mama Studios with internationally-acclaimed vocalist/voice coach extraordinaire Tita Farrar. Alicia lives in Sherman Oaks, CA with her family. She is a wife of one, mother of three, stepmom of one, concierge of three Burmese cats and a Beagle.